Until the end of this turn, the ATK of all "Harpie Lady Sisters" currently on the field becomes 2700, your opponent cannot activate any Trap Cards, also negate all your opponent's Trap effects on the field. Harpie Lady 1, Harpie Lady 2, and Harpie Lady 3 appear in this card's artwork. In the original Japanese version of the manga and anime, as well as Yu-Gi-Oh! The Falsebound Kingdom, this was the attack name of Harpie Lady Sisters. The Harpie Lady Sisters (whose likenesses take after Harpie Lady 1, [Harpie Lady 2, and Harpie Lady 3 minus them wearing Cyber Shield,) used an attack in the style of this card's artwork in episode 30 to destroy Yami Yugi's Mystical Elf. In the International dub, this was renamed the Exterminator Attack. It's odd why this card didn't take its International name as it would also successfully censor this card's name; the second word within it (ecstasy) in-part, is also a street name for MDMA (also known as 3,4-methyl​enedioxy​methamphetamine, a strong psychoactive drug). This card's artwork is taken from , specifically from the panel showing Harpy Lady Sisters attacking Mystical Elf. However, the sisters are wearing Cyber Shield in the said scene. You cannot activate "Triangle Ecstasy Spark" if "Harpie Lady Sisters" is not on the field. 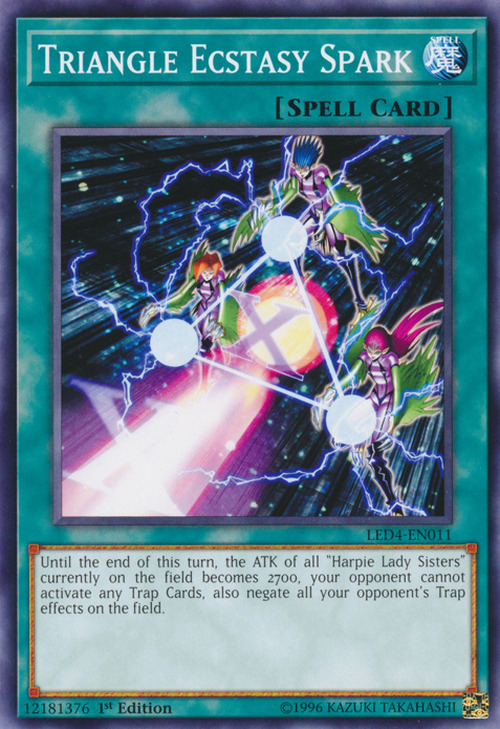 You can activate it if the opponent controls a "Harpie Lady Sisters". In that case the ATK of the opponent's "Harpie Lady Sisters" will become 2700, but the opponent still cannot activate Trap Cards, and the effects of Trap Cards on the opponent's side of the field are negated.